/ Come and meet Celebrant Michelle Taylor. Who wouldn’t want this beaming face of joy at their wedding ceremony? I’m beyond excited to shine the spotlight on this awesome specimen of a Wedding Celebrant, Michelle Taylor. If there’s anyone who puts the funk into funky, it’s Michelle. You are going to love reading all about her, from how she became a Wedding Celebrant, let’s just say she went from arresting people with handcuffs to arresting people with her jaw-dropping words of love, to everything she loves about being a Celebrant. 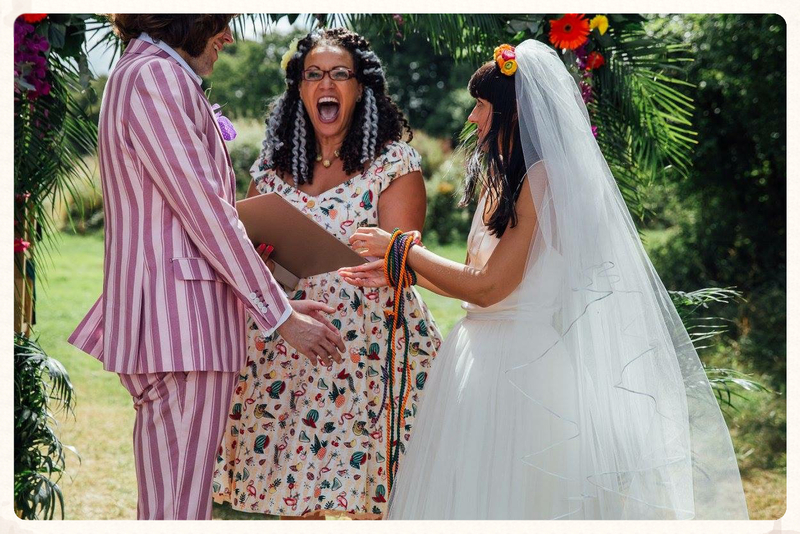 This Essex-based, UK Celebrant describes herself as ‘funky, a Potterhead and quirky.’ Yep, she’s obsessed with all things Harry Potter and loves nothing more than weaving HP into wedding ceremonies for the equally obsessed Potterite wedding couples out there! So come and read all about Michelle, her passion for what she does and why this funky Celebrant, can put the funk into all manner of ceremonies. I spent 30 years as a police officer in 3 forces in the UK, and 2 years as a cadet in West Mids Police, so since the age of 16, policing is all I’d ever known. It was a vocation, and one I was proud to have held, but boy, did I see some dark stuff. So what made you become a Celebrant? My husband wanted me to work with him as a wedding photographer. I can’t take a picture to save my life and said I’d rather marry people. So this was in 2010/2011 and I was due to retire from the day job in late 2015. I looked into it and realised it was something I could do whilst I was still serving as police officer as there was no conflict of interest. So there it was, my 5 year retirement plan. I was only 48 when I retired and wasn’t ready for the joys of pensioner hood just yet. I love sharing the love and it is honestly the best job ever. What elements from your previous job do you continue to rely on as a Celebrant? I can remain calm in a crisis, my presence is enough to cool any inflamed situation. I’m bossy, but in a good way. I can write and talk the hind leg off a donkey. There is very little that will shock or throw me, and if it does, you’ll never know about it! My biggest wedding was an ex England Footballers in 2014. It was a bit scary, but as I know nothing about football I wasn’t star struck. Now if it had been rugby, it would have been a totally different ball game, literally! My highlights have been many and varied though. Including winning the regional award (East of England ) at theThe Wedding Industry Awards 2018. Rebranding and creating a brand that truly reflects me. My journey through celebrancy over the years as a whole. I started off a bit beige and samey, but I have now developed a very unique style and love spreading my brand of slightly-out-there celebrancy. I love the fact I can look back over time and see how I have developed and how my client-base reflects that my ceremonies have evolved and I am having the best time of my life. Don’t overthink or try to micromanage on the day, it will all go pear shaped if you do. Plan up to the day, step back and relax and enjoy the big day. Your carefully chosen wedding suppliers will hold you safely in their hands. What has being a Celebrant taught you about life and people in general? That life is short, love is precious. Live, laugh and celebrate. Your day your way is definitely a mantra that needs to be adopted. We are all unique and our ceremonies should reflect that uniqueness. Creating the ceremony, and getting the feedback on the first draft, the ‘we LOVE it’ really makes my day. Outdoors, for the space and the quirky ones because they suit my personality. I love festival style weddings. Quirky venues, which have such a good vibe. The vodka, bread and salt ceremony, because there’s vodka involved! It is an adaptable ceremony that is Eastern European in its roots, but my couples make it their own with the inclusion of their own food and drink (cake and ouzo, crisps and gin…you get the picture). It is a fun and interactive ceremony. A FULL ON DRESS UP HARRY POTTER!!!! I will be Dumbledora, hehehe. I have the wand and everything! 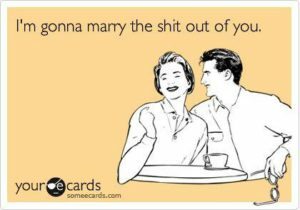 Or any fandom to be fair, where we can dress up and have fun re-enacting wedding scenes or learning lines and indulging the couples (and maybe the Celebrant’s) wildest dreams! What kind of couples do you love working with? Those who are willing to step outside of the proverbial box and who want to do something a little bit different. Couples have choice, like never before. Inclusive, anything goes. Fun, no longer restricted to 3 script choices in a registry office or a religious ceremony. Celebrancy is exploding and with the right celebrant for you, your ceremony will live on in the memory of all who attended for the longest time and for the right reasons! One of Michelle’s couples jumping the broom during a ceremony with her. I always turn up to a ceremony an hour before to check last minute details etc. Last year I arrived at one 1 hr and 15 minutes before it was due to start, lovely, plenty of time to chat with the brides and get myself organised.The photographer started to hurry me up saying we’re on in 5 about 10 minutes into my prep. No we’re not I said, the ceremony starts at 2. He replies ‘NOPE’. The couple had brought the time forward at some stage in their planning, told the guests but neglected to tell the Celebrant!!!! We’d even had the practice the day before and I told them what time I would be there and it didn’t register! Luckily I arrived when I did…so the moral of my tale is check, double check and triple check the starting time of the ceremony! When you’re not busy being a Celebrant, what do you love doing? Sleeping! Oh and exploring the wizarding world, be it in a book or a film…. Don’t you just love her? If you’re interested in Michelle conducting a ceremony for you (and why the hell wouldn’t you be?) hop over to her website, Michelle Taylor Celebrant and snap her up before someone else does!